The game of golf is a multi-million pound business, and the same is true for the equipment. So many players starting off on the road to developing their game can be seduced into watching the great players and make of club they use, and think that is the one for them. Choosing the same brand as Tiger Woods will not make you a multi-major winner just as wearing a straw hat with a great white shark emblem won't have anyone on the course mistaking you for Greg Norman. The first thing to take into consideration is cost. Like those expensive gym memberships bought with the best of intentions but left to gather dust once the first flush of enthusiasm has passed, the novice does not want to place too much strain on his or her wallet only to find, heaven forbid, that the frustration felt by many starting out is all too much and those expensive clubs are left in the corner, keeping the gym membership company. Savings can be made by buying second-hand rather than new but as with all goods that have already had one or more owners, it is important to check the condition. 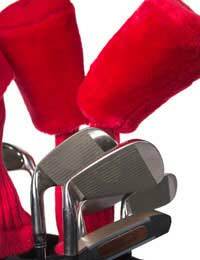 In the case of golf clubs, this means ensuring that the grip is not worn and that the grooves of the club face are well defined. In terms of the shaft, think about the flex and whether it suits your swing: too much or too little flex will result in miss-hit shots, resulting in frustration and discouragement. Attention should also be given to whether the length of the club is suited to your stature. The best way to avoid any of the above pitfalls is to visit a club shop and seek the advice of the club pro. He or she will be able to advise on what you need and what you should be paying for them. In general, which clubs should you be aiming to buy? First, avoid the driver. This is not a club that is forgiving of the shortcomings of the enthusiastic beginner and its use can result in a lot of lost balls - always assuming you made contact in the first place. Rather choose a three wood and supplement it with three, five, seven and nine irons that will be more than adequate for both the long and short game. To complete your half-set of seven clubs, include a sand wedge for the inevitable bunkers that await the rookie, and should you make the green, a putter. In terms of buying new, there is a bewildering range on offer, both on the high street and the internet. Some half sets are available for under £200, others for less than £50! Word of mouth is the key here, whether, again, talking to the club pro or asking friends or fellow club members what they think is good or not so good value. But new or second-hand, whatever the manufacturer's brand, always remember that it is important to get off to a good start and picking the right clubs is vital in achieving this. They will not only aid the learning process but give you the encouragement to take your game to the next level.